Where are you going to study English? With so many schools and English language programs available, the decision of where to go can be overwhelming. We’re pretty biased towards Denver because it’s our home city and we think life here is great. But you don’t want to make your decision based on our opinion; you want some facts. On average, tuition at BridgeEnglish Denver is $400-$500 less than tuition at top English schools in London. What will you do with that extra money in your pocket? 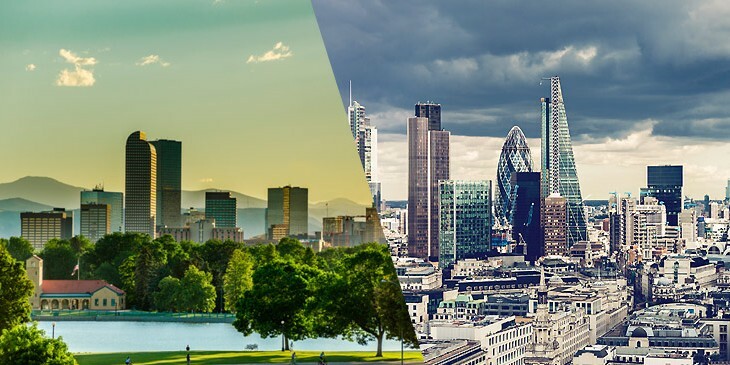 Denver’s score on the Quality of Life Index is a whopping 197 compared to London’s 84. The Quality of Life index takes into account factors such as pollution, traffic, healthcare, housing prices, climate, and safety. Your money will go a lot further. Denver’s cost of living (public transportation, food, and lodging) is considerably less than London’s. Your average lunch will cost a whopping US$21 in London, as opposed to just US$13 in Denver. This means you will live comfortably as an English student, with more money for dining out, nightlife, and weekend trips. You can relax when you’re out on city streets. For overall safety Denver ranks higher than London, so you can feel secure whether you are on your way to class, sightseeing, or enjoying the weekend nightlife. You’ll get plenty of sunshine. Denver gets 300 days of sunshine a year. Yes, 300 days of sun! That’s five times more than London’s 60 days. What will you do with so many days of sun? For starters you will find the Rocky Mountains just an hour west of the city, where you can ski, hike, kayak, snowshoe, camp, and engage in just about any outdoor activity you can dream up. On days when you need to stay close to home, Denver boasts nearly 20,000 acres of urban parkland. With all that time outdoors, you will be thankful that Denver scores a low 39.5 on the pollution index, compared to London’s 53.4 points. So there you have it. Choose to study English in Denver and you’ll get some extra money in your pocket, an easy life in a friendly, safe, and affordable city, and more sunshine and fresh Rocky Mountain air than you know what to do with. Are you ready to discover the best kept secret in the United States? We can’t wait to introduce you to our city. Request information today to get started on your Denver adventure. esl-blog BridgeEnglish in Denver, Colorado, Denver, General Info. permalink.